Do you feel like you just don’t have enough time? If I might offer a bit of advice, I’d say that starting your own business is definitely not a good way to alleviate those symptoms. When The Hour After Happy Hour last left off, we were talking about Dean, Jason, and myself. Just because I hadn’t blogged them, doesn’t mean the submissions stopped pouring in. Much like this summer, it has continuously poured. Lea Bridi kind of killed it with an awesome re-write of “Lines and Curves,” a story of opposites colliding. Set in State College, PA, Emily, the protagonist, takes the subway to class when she’s approached by an Evangelical Christian. The first time Lea sent us the story there was a fist-fight, the new ending revealed something far more complex, but I won’t spoil it for you. Beautiful imagery and symbolism abound: a ticking clock, multiple points-of-view – what could be better? We’ve also been treated to two submissions from the great Martin Van Velsen. The first of which was the first and second act of “Kill the Critic.” A gem that only Martin could write that opens with Truman Capote and Oscar Wilde barging in on a innocuous writing critic. There is murder, mystery and intrigue. In addition to submitting an awesome story, Lea Bridi facilitated the following week, since my sister decided to do this thing where she got married. With Lea’s stern but loving hand, the group workshopped pieces from Tyson Hymes and Beth Hazley. Tyson’s “Bernie Duncan” is a hilarious story about a feckless man, named Bernie Duncan who gets caught up in political scandal. It’s told a la David Foster Wallace “Brief Interviews with Hideous Men”, in interview/interrogation format. Gradually, we learn Theo’s secret life is in collision public life, as his partner is unable to visit him. Beth weaves the story together a way that only she can tell – where sound, and science hit hard. 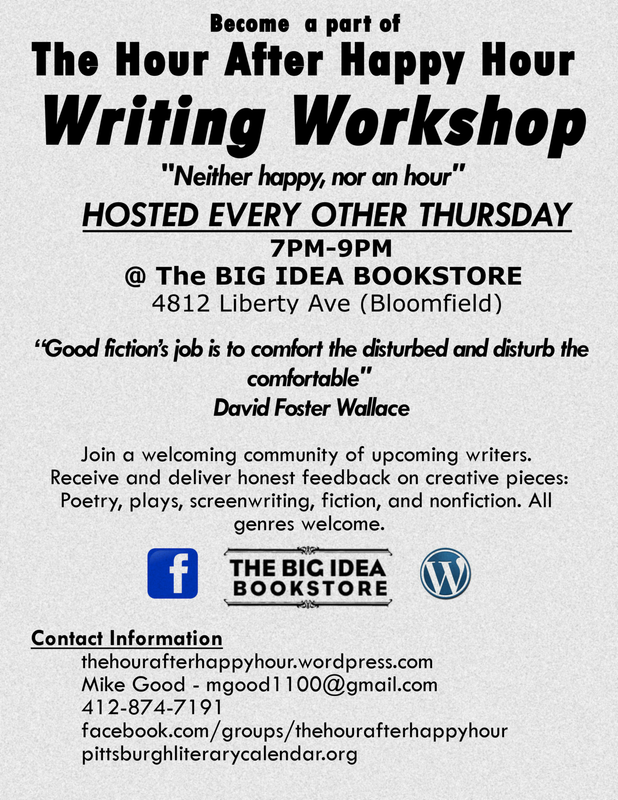 The following workshop featured the fiery inferno that is Charlie Brown, and Hour After Happy Hour heavyweight Mike Lambert. Charlie’s story was a rewrite of an old college short story, and employed a mix-tape to break up and add to the narration. Titled “Lay Lady Lay” there is a little bit for everyone to like – Chinese food and automobiles. Mike Lambert treated the group to the third chapter of his novel in-progress – in which we got to meet Victor. The character who never seems to slip up and is always two steps ahead of everyone else. Victor just wins. Last week, we discussed a short-story submitted by myself as well as fiction by Martin’s second submission. My story follows Jerry Dulaney, a twice unemployed HVAC technician as he learns he’s about to be fired. I enjoyed writing it, and got some great feedback. Also we have a new flyer and really want you to come out to the next workshop, where we’ll be discussing Jason Peck, and someone else who is completely awesome but I’m already forgetting. We were also overjoyed to welcome a new member to the group – Christina – a recent college graduate with a passion for screenwriting. Previous PostWhat happened last month? Next PostCake, Poems, and What’s Happening Here?